At the center of our galaxy, roughly 26,000 light years from Earth, lies the Supermassive Black Hole (SMBH) known as Sagittarius A*. Measuring 44 million km across, this object is roughly 4 million times as massive as our Sun and exerts a tremendous gravitational pull. Since astronomers cannot detect black holes directly, its existence has been determined largely from the effect it has on the small group of stars orbiting it. Developed by an international consortium led by the Max Planck Institute for Extraterrestrial Physics, this instrument has been conducting observations of the Galactic Center since 2016. In 2018, it will be used to measure the orbit of S2 with even greater precision, which is expected to be most revealing. At this time, astrophysicists will be seeking to make additional measurements of the SMBH’s general relativistic effects. With proposed missions to Mars and plans to establish outposts on the Moon in the coming decades, there are several questions about what effects time spent in space or on other planets could have on the human body. Beyond the normal range of questions concerning the effects of radiation and lower-g on our muscles, bones, and organs, there is also the question of how space travel could impact our ability to reproduce. Earlier this week – on Monday, May 22nd – a team of Japanese researchers announced findings that could shed light on this question. Using a sample of freeze-dried mouse sperm, the team was able to produce a litter of healthy baby mice. As part of a fertility study, the mouse sperm had spent nine months aboard the International Space Station (between 2013 and 2014). The real question now is, can the same be done for human babies? The study was led by Sayaka Wakayama, a student researcher at the University of Yamanashi‘s Advanced Biotechnology Center. As she and her colleagues explain in their study – which was recently published in the Proceedings of the National Academy of Sciences – assisted reproductive technology will be needed if humanity ever intends to live in space long-term. As such, studies that address the effect that living in space could have on human reproduction are needed first. These need to address the impact microgravity (or low-gravity) could have on fertility, human abilities to conceive, and the development of children. And more importantly, they need to deal with one of the greatest hazards of spending time in space – which is the threat posed by solar and cosmic radiation. To be fair, one need not go far to feel the effects of space radiation. The ISS regularly receives more than 100 times the amount of radiation that Earth’s surface does, which can result in genetic damage if sufficient safeguards are not in place. On other Solar bodies – like Mars and the Moon, which do not have a protective magnetosphere – the situation is similar. And while the effects of radiation on adults has been studied extensively, the potential damage that could be caused to our offspring has not. How might solar and cosmic radiation affect our ability to reproduce, and how might this radiation affect children when they are still in the womb, and once they are born? Hoping to take the first steps in addressing these questions, Wakayama and her colleagues selected the spermatozoa of mice. The samples spent nine months aboard the ISS, during which time they were kept at a constant temperature of -95 °C (-139 °F). During launch and recovery, however, they were at room temperature. After retrieval, Wakayama and her team found that the samples had suffered some minor damage,. In addition to being reparable, the sperm samples were still able to fertilize mouse embryos (once they were brought back to Earth) and produce mouse offspring, all of which grew to maturity and showed normal fertility levels. They also noted that the fertilization and birth rates were similar to those of control groups, and that only minor genomic differences existed between those and the mouse created using the test sperm. From all this, they demonstrated that while exposure to space radiation can damage DNA, it need not affect the production of viable offspring (at least within a nine month period). Moreover, the results indicate that human and domestic animals could be produced from space-preserved spermatozoa, which could be mighty useful when it comes to colonizing space and other planets. However, a lingering issue with these sorts of tests is being able to differentiate between the effects of microgravity and radiation. In the past, research has been conducted that showed how exposure to simulated microgravity can reduce DNA repair capacity and induce DNA damage in humans. Other studies have raised the issue of the interplay between the two, and how further experiments are needed to address the precise impact of each. In the future, it may be possible to differentiate between the two by placing samples of spermatazoa and ova in a torus that is capable of simulating Earth gravity (1 g). Similarly, shielded modules could be used to isolate the effects of low or even micro-gravity. Beyond that, there will likely be lingering uncertainties until such time as babies are actually born in space, or in a lunar or Martian environment. And of course, the long-terms impact of reduced gravity and radiation on human evolution remains to be seen. In all likelihood, that won’t become clear for generations to come, and will require multi-generational studies of children born away from Earth to see how they and their progeny differ. The Milky Way’s supermassive black hole, called Sagittarius A* (or Sgr A*), is arrowed in the image made of the innermost galactic center in X-ray light by NASA’s Chandra Observatory. To the left or east of Sgr A* is Sgr A East, a large cloud that may be the remnant of a supernova. Centered on Sgr A* is a spiral shaped group of gas streamers that might be falling onto the hole. Credit: NASA/CXC/MIT/Frederick K. Baganoff et al. So one can say without exaggerations that gravity is not only a fact of life here on Earth, but a prerequisite for it. However, since human beings seem intent on getting off this rock – escaping the “surly bonds of Earth”, as it were – understanding Earth’s gravity and what it takes to escape it is necessary. So just how strong is Earth’s gravity? To break it down, gravity is a natural phenomena in which all things that possess mass are brought towards one another – i.e. asteroids, planets, stars, galaxies, super clusters, etc. The more mass an object has, the more gravity it will exert on objects around it. The gravitational force of an object is also dependent on distance – i.e. the amount it exerts on an object decreases with increased distance. Gravity is also one of the four fundamental forces which govern all interactions in nature (along with weak nuclear force, strong nuclear force, and electromagnetism). Of these forces, gravity is the weakest, being approximately 1038 times weaker than the strong nuclear force, 1036 times weaker than the electromagnetic force and 1029 times weaker than the weak nuclear force. As a consequence, gravity has a negligible influence on matter at the smallest of scales (i.e. subatomic particles). However, at the macroscopic level – that of planets, stars, galaxies, etc. – gravity is the dominant force affecting the interactions of matter. It causes the formation, shape and trajectory of astronomical bodies, and governs astronomical behavior. 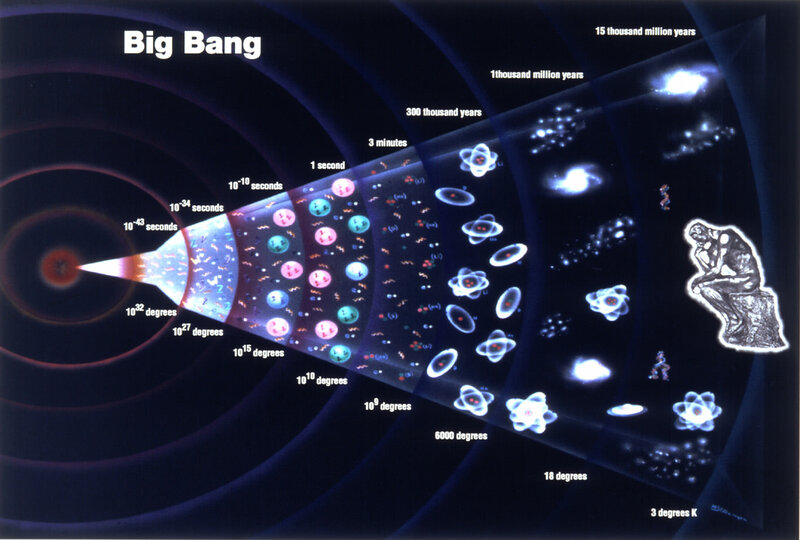 It also played a major role in the evolution of the early Universe. It was responsible for matter clumping together to form clouds of gas that underwent gravitational collapse, forming the first stars – which were then drawn together to form the first galaxies. And within individual star systems, it caused dust and gas to coalesce to form the planets. It also governs the orbits of the planets around stars, of moons around planets, the rotation of stars around their galaxy’s center, and the merging of galaxies. Since energy and mass are equivalent, all forms of energy, including light, also cause gravitation and are under the influence of it. This is consistent with Einstein’s General Theory of Relativity, which remains the best means of describing gravity’s behavior. According to this theory, gravity is not a force, but a consequence of the curvature of spacetime caused by the uneven distribution of mass/energy. The most extreme example of this curvature of spacetime is a black hole, from which nothing can escape. Black holes are usually the product of a supermassive star that has gone supernova, leaving behind a white dwarf remnant that has so much mass, it’s escape velocity is greater than the speed of light. An increase in gravity also results in gravitational time dilation, where the passage of time occurs more slowly. For most applications though, gravity is best explained by Newton’s Law of Universal Gravitation, which states that gravity exists as an attraction between two bodies. The strength of this attraction can calculated mathematically, where the attractive force is directly proportional to the product of their masses and inversely proportional to the square of the distance between them. On Earth, gravity gives weight to physical objects and causes the ocean tides. The force of Earth’s gravity is the result of the planets mass and density – 5.97237 × 1024 kg (1.31668×1025 lbs) and 5.514 g/cm3, respectively. This results in Earth having a gravitational strength of 9.8 m/s² close to the surface (also known as 1 g), which naturally decreases the farther away one is from the surface. In addition, the force of gravity on Earth actually changes depending on where you’re standing on it. The first reason is because the Earth is rotating. This means that the gravity of Earth at the equator is 9.789 m/s2, while the force of gravity at the poles is 9.832 m/s2. In other words, you weigh more at the poles than you do at the equator because of this centripetal force, but only slightly more. Finally, the force of gravity can change depending on what’s under the Earth beneath you. Higher concentrations of mass, like high-density rocks or minerals can change the force of gravity that you feel. But of course, this amount is too slight to be noticeable. NASA missions have mapped the Earth’s gravity field with incredible accuracy, showing variations in its strength, depending on location. Gravity also decreases with altitude, since you’re further away from the Earth’s center. The decrease in force from climbing to the top of a mountain is pretty minimal (0.28% less gravity at the top of Mount Everest), but if you’re high enough to reach the International Space Station (ISS), you would experience 90% of the force of gravity you’d feel on the surface. However, since the station is in a state of free fall (and also in the vacuum of space) objects and astronauts aboard the ISS are capable of floating around. Basically, since everything aboard the station is falling at the same rate towards the Earth, those aboard the ISS have the feeling of being weightless – even though they still weight about 90% of what they would on Earth’s surface. Earth’s gravity is also responsible for our planet having an “escape velocity” of 11.186 km/s (or 6.951 mi/s). Essentially, this means that a rocket needs to achieve this speed before it can hope to break free of Earth’s gravity and reach space. And with most rocket launches, the majority of their thrust is dedicated to this task alone. Because of the difference between Earth’s gravity and the gravitational force on other bodies – like the Moon (1.62 m/s²; 0.1654 g) and Mars (3.711 m/s²; 0.376 g) – scientists are uncertain what the effects would be to astronauts who went on long-term missions to these bodies. While studies have shown that long-duration missions in microgravity (i.e. on the ISS) have a detrimental effect on astronaut health (including loss of bone density, muscle degeneration, damage to organs and to eyesight) no studies have been conducted regarding the effects of lower-gravity environments. But given the multiple proposals made to return to the Moon, and NASA’s proposed “Journey to Mars“, that information should be forthcoming! As terrestrial beings, we humans are both blessed and cursed by the force of Earth’s gravity. On the one hand, it makes getting into space rather difficult and expensive. On the other, it ensures our health, since our species is the product of billions of years of species evolution that took place in a 1 g environment. If we ever hope to become a truly space-faring and interplanetary species, we better figure out how we’re going to deal with microgravity and lower-gravity. Otherwise, none of us are likely to get off-world for very long! We have written many articles about the Earth for Universe Today. Here’s Where Does Gravity Come From?, Who Discovered Gravity?, Why is the Earth Round?, Why Doesn’t the Sun Steal the Moon?, Could We Make Artificial Gravity?, and The “Potsdam Gravity Potato” Shows Variations in Earth’s Gravity. We have also recorded an episode of Astronomy Cast about Earth, as part of our tour through the Solar System – Episode 51: Earth, and Episode 318: Escape Velocity. NASA: Space Place – What is Gravity Really? A rare object called an Einstein Ring has been discovered by a team in the Stellar Populations group at the Instituto de Astrofísica de Canarias (IAC) in Spain. An Einstein Ring is a specific type of gravitational lensing. Einstein’s Theory of General Relativity predicted the phenomena of gravitational lensing. Gravitational lensing tells us that instead of travelling in a straight line, light from a source can be bent by a massive object, like a black hole or a galaxy, which itself bends space time. Einstein’s General Relativity was published in 1915, but a few years before that, in 1912, Einstein predicted the bending of light. Russian physicist Orest Chwolson was the first to mention the ring effect in scientific literature in 1924, which is why the rings are also called Einstein-Chwolson rings. Gravitational lensing is fairly well-known, and many gravitational lenses have been observed. Einstein rings are rarer, because the observer, source, and lens all have to be aligned. Einstein himself thought that one would never be observed at all. “Of course, there is no hope of observing this phenomenon directly,” Einstein wrote in 1936. The team behind the recent discovery was led by PhD student Margherita Bettinelli at the University of La Laguna, and Antonio Aparicio and Sebastian Hidalgo of the Stellar Populations group at the Instituto de Astrofísica de Canarias (IAC) in Spain. Because of the rarity of these objects, and the strong scientific interest in them, this one was given a name: The Canarias Einstein Ring. There are three components to an Einstein Ring. The first is the observer, which in this case means telescopes here on Earth. The second is the lens galaxy, a massive galaxy with enormous gravity. This gravity warps space-time so that not only are objects drawn to it, but light itself is forced to travel along a curved path. The lens lies between Earth and the third component, the source galaxy. The light from the source galaxy is bent into a ring form by the power of the lens galaxy. When all three components are aligned precisely, which is very rare, the light from the source galaxy is formed into a circle with the lens galaxy right in the centre. The circle won’t be perfect; it will have irregularities that reflect irregularities in the gravitational force of the lens galaxy. Looking at these objects is like looking back in time, too. The source galaxy is 10 billion light years from Earth. Expansion of the Universe means that the light has taken 8.5 billion light years to reach us. That’s why the ring is blue; that long ago, the source galaxy was young, full of hot blue stars. The lens itself is much closer to us, but still very distant. It’s 6 billion light years away. 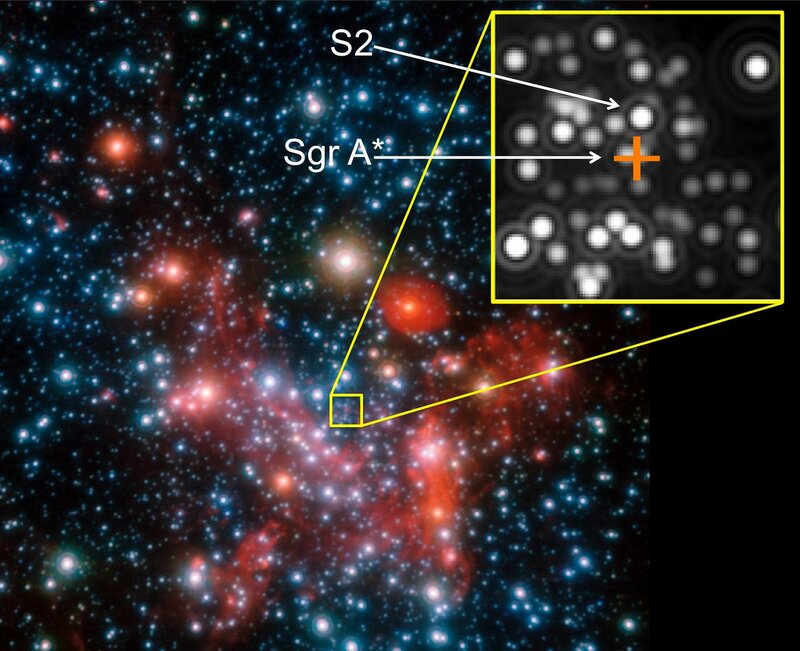 Star formation in that galaxy likely came to a halt, and its stellar population is now old. The discovery of the Canarias Einstein Ring was a happy accident. Bettinelli was pouring over data from what’s known as the Dark Energy Camera (DECam) of the 4m Blanco Telescope at the Cerro Tololo Observatory, in Chile. She was studying the stellar population of the Sculptor dwarf galaxy for her PhD when the Einstein Ring caught her attention. Other members of the Stellar Population Group then used OSIRIS spectrograph on the Gran Telescopio CANARIAS (GTC) to observe and analyze it further.